Well folks, this is post no. 404! We've quietly streaked past the 400th post milestone and also crossed the half-millionth pageview mark. I'm still quite flabbergasted that more than a thousand people a day visit this humble site - some of you I have come to know via the comments but most are lurkers - so here's a big HI and THANK YOU to everyone for popping by! Why am I highlighting the number (404) that is also famously the HTTP response code for pages not found? Cos these days I can't seem to find good food or interesting eateries to blog. Also haven't been able to venture out much, what with sick MIL at home. I do hope to pick up the pace again soon. So it's been mostly simple home-cooked fare. 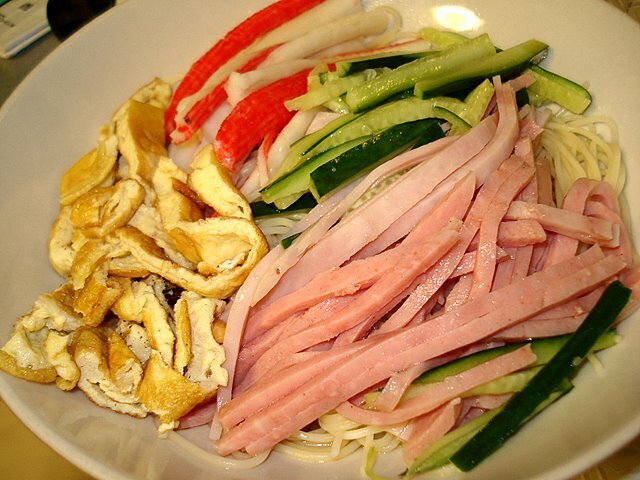 Last night we had hiyashi chuuka - the Japanese cold Chinese-style noodles that's a summertime favourite. I was a bit hesitant to use angel hair pasta but it turned out pretty acceptable. Recipe adapted from bento.com. Toppings: really anything you like. Noodles: 8 ounces or 200g angel hair spaghetti, boiled til al dente. Rinse them in cold water to stop the cooking process. You can either refrigerate the noodles in advance or add some ice cubes to cool them further. Wow, looks yummy! *slurp* Simple and easy to prepare. And very colorful too. Spot on! I'm one of the lukers. Love your blog, esp. the food photos. Keep it up! we need to get the whole gang together and nom nom nom soon! Congrats on your 404 post. Many more great ones to come. Cheers! hi there! congratulations on your half a million mark! looks good!! and it sounds simple to make. is the angel hair chewy? must refrigerate them right? didally: yup, it's very easy to make! LFB: haha, I just hope I can make it to 888 posts!!! then can retire? Hello Jess, thank you for your encouragement! Southernoise: yaaa...need some good food!! Nic: lol, where to eat, o where to eat!? perennial dilemma! ah Teo: the angel hair pasta is not exactly chewy like ramen but can be al dente. I just rinsed them in cold water and threw some ice cubes on top of them to make them cold. Good reminder, I'll add that to the instructions.